It is pretty clear to even outside observers not paying too much attention to the international scene that the man running Russia is one Vladimir Putin. The “former” president and current Prime Minister hand picked his successer in the top post, Dmitry Medvedev, who is the former head of the biggest Russian state money maker, Gazprom, the oil giant. Medvedev, thanks to Putin, went from Gazprom to Putin’s chief of staff and then to the presidency of Russia. Medvedev has already said he will ask parliament to lengthen the term Russian president’s serve so that the next president, whom all analysts believe will be Putin (Part Deux), can have a longer Kremlin tour. 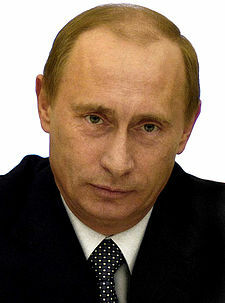 Putin, a former KGB intelligence operative, is the strong man of the Kremlin and all of Russia. After he sparked the Russian invasion of South Ossietia and Georgia last summer, he was quoted by the Times in London as saying he wanted to “hang by the balls” Georgia’s President Mikheil Saakashvili. Putin made the “by the balls” remark to a man he considers to be a lightweight: French President Sarkozy. Peace and Freedom was told by a source inside the Moscow leadership that Putin refers to “lightweights” using derisive, feminine terms and names from fairy tales and stories. Sarkozy and Medvedev have been called “Tinkerbell” by Putin, we were told. Putin showed who had the balls in the Georgia invasion all right. Kremilin insiders said the attack was Putin’s brainchild and not of Medvedev’s making. Then we have Mr. Putin’s he-man media blitz. Photographs of Putin hunting, fishing, swimming, lifting weights, skinning game and shooting have appeared routinely in the Russian media. Putin’s “manliness” is rivaled on the world media stage only by Sarah Palin’s moose hunting…. Putin also engineered the intimidation of Barack Obama just hours after the American Presidential election, threatening Eastern Europe with Iskander ballistic missiles unless the U.S. backed off of its missile defense plan in Poland and the Czech Republic. What does this all mean? It isn’t entirely clear. But one thing is certain: inside Russia Putin is “the man.” The average Russian considers Putin a strong man who represents Russia very well. “He is bringing back Soviet greatness” one veteran told us. And if weak-sister Tinkerbells in the West don’t like it, Russia and Putin don’t much care. Another presidential campaign is under way this week – this one in Russia.On March 2, Russians will vote in a pro-forma election for a successor to KGB man Vladimir V. Putin. The Kremlin has handpicked a former law professor, Dmitry Medvedev, though Putin may try to remain the power behind the scenes.Medvedev, however, is trying to present a softer face than his mentor; he pledged in his first campaign speech last Friday to make everyone accountable before the law. Putin, by contrast, has used the law as a club to bludgeon opponents. If Medvedev means what he says, he ought to condemn a travesty of justice going on now in Moscow that makes Russia look as if it has reverted to the Stalin era. Moscow courts are refusing medical treatment to a former Russian oil executive, Vasily Aleksanian…. Whichever candidate emerges from the primaries to win the presidential election this November will face a series of foreign policy challenges unlike anything since Thomas Jefferson took office, when our new nation faced its first messy, dangerous and inexplicable challenge from afar. In 1801, the threat came from North African pirate states, far from America’s shores, whose better-equipped naval vessels were seizing U.S. merchant ships and extorting huge sums in tribute from our Treasury. Today, the immediate threat comes from jihadi Islam, and the primary state-sponsor of terror: the Islamic Republic of Iran. Both are as inexplicable and…. Re-election Strategy or New Cold War? The question in Washington and European capitals this fall is whether Moscow’s aggressive behavior is the onset of a new Cold War or just a gambit to win votes in upcoming elections. The central issue is the future of Russian President Vladimir Putin. Russia’s hard-earned democracy is rapidly morphing back into an authoritarian state under President Putin, who is eager to stay in power. He probably could scrap the constitution and become president for life, but has said he will not do that. More likely, he plans to put a puppet in the presidency and rule from behind the scenes or as prime minister, and then run for president again in 2012. The Russian constitution adopted in 1993 states in Chapter 4, Article 81, “No one person shall hold the office of president for more than two terms in succession.” Mr. Putin was elected in 2000 and won reelection with a 71 percent landslide in 2004. He will complete two terms in 2008, so is ineligible under the constitution to run next year, but could run in 2012 or later. Elections to the Duma will be held on December 2, after which the political parties will nominate their candidates for president. That election will be March 2, with the new president taking office May 7. Less than six months before the election Vladimir Putin stands astride Russian politics like a colossus, with polls showing an approval rate as high as 80 percent. Videos have been released showing Mr. Putin in campaign mode, a vigorous 55, horseback riding and fishing. For months he has been taking step after step to appeal to the majority of Russians who yearn for a return to the great power status their country lost when the Soviet Union collapsed. He is taking advantage of the booming global market for energy, renationalizing the oil and gas industry and using the proceeds to rebuild Russia’s military. For years, Russia has been developing the Topol-M mobile ballistic missile, the Bulava submarine-launched ballistic missile, a new multiple-warhead missile, a new evading warhead, the S-400 missile interceptor, fifth-generation fighter planes and four new missile-firing submarines. Progress was slow and funds scarce, but the recent surge in oil and gas wealth has made it possible to expand and accelerate these programs. Now Mr. Putin is using his improving military to throw his weight around, confronting countries from Georgia to Norway. He has resumed long-range nuclear bomber flights, opposes missile defenses in Europe, claims the North Pole for Russia and suspends cooperation under the Conventional Forces in Europe (CFE) treaty. He also sells air defense missiles to Syria and nuclear technology to Iran, suspends gas and oil shipments to pressure other countries, and threatens both to withdraw from the Intermediate Nuclear forces (INF) treaty and to target NATO countries by basing missiles in Russia’s Kaliningrad enclave. Instead of joining Europe and America against the threat of militant Islam, Mr. Putin has joined with China, Iran and other authoritarian regimes against the West. All this appears to be fine with most Russians. A poll by the Yuri-Levada Institute found that 68 percent of Russians said their top priority was security. Democracy was hardly mentioned. Other results showed that 75 percent consider Russia a Eurasian state, while only 10 percent see themselves part of the West. 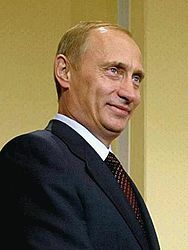 Mr. Putin could decide to emulate his friend, Venezuela’s President Hugo Chavez, and make himself president for life. Amending the Russian constitution requires large majorities in both the Federation Council and Duma, which he probably could get from those rubber-stamp bodies, but it would require compomises he may not want to make. Instead, he probably will handpick a temporary successor. Until a few weeks ago, First Deputy Prime Minister Sergei Ivanov, a former KGB officer and recent defense minister, was considered the most likely choice. But he could be a strong leader and Mr. Putin may prefer to name a more subservient caretaker for one term. That could explain why he recently chose Viktor Zubkov, a loyal 66-year old nonentity, to be prime minister. Mr. Zubkov may also be Mr. Putin’s choice to keep the president’s seat warm until he can legally return to that office in 2012. The bluster from Moscow could be just a run-up to the elections, to show voters President Putin takes a hard line toward foreign powers he claims are encroaching on Russia’s borders. This xenophobic anti-West foreign policy seems very popular in Russia. It may also reflect a resurgence of Cold War thinking by Mr. Putin and his ex-KGB colleagues, who spent decades confronting the West. Whether we are in for a brief pre-election spell of Russian aggressiveness or a long-term struggle with a new anti-Western axis led by Moscow and Beijing remains to be seen. We will have a better idea next spring, when Russia chooses its next president. James Hackett is a former national security official who now lives and writes in Carlsbad, Calif. He is a frequent contributor to the Washington Times and other national journals and newspapers. Just when we thought we had things figured out, Russian President Vladimir Putin did the unexpected. He announced he would head the party list in the election and as such would surely be named prime minister by whoever his successor might be. We had thought Mr. Putin would yield power to a successor, anointed by him but also approved by the KGB state, and retire to a lucrative sinecure, such as chief executive officer of Gazprom. It now appears he wishes to hold on to power, either as the head of revamped government or as a replacement for an aging president who somehow decides to step down in his favor. The consensus had been that his successor would be chosen by Russia-KGB Inc. It did not particularly matter if it was an obscure figure (as was Mr. Putin in 1999) or already known on the world stage. We now have to go back to the drawing board to figure this out. What do we know for sure? MOSCOW, Oct. 13 — Balloting for Parliament will be held across Russia in December, and this much is already clear: Vladimir A. Ryzhkov, who was first elected in the turbulent yet hopeful days after the Soviet Union’s fall and then blossomed into a fervent advocate for democracy, will lose. So will Viktor V. Pokhmelkin, who used his seat to crusade against corruption in the police and other law enforcement agencies. Swept away, too, will be Anatoly A. Yermolin, a K.G.B. officer turned liberal stalwart who has been a lone voice in rebellion against President Vladimir V. Putin’s expansive power. Nearly eight years after Mr. Putin took office and began tightening his control over all aspects of the Russian government, he will almost certainly with this election succeed in extinguishing the last embers of opposition in Parliament. Russia may be a democracy, but it is rapidly morphing back into an authoritarian state. President Vladimir Putin looks very much like a man running for re-election. The question is whether he plans to scrap the constitution and become president for life or rule from behind the scenes and return to office later. The constitution adopted in 1993 by the new Russia states in Chapter 4, Article 81, “No one person shall hold the office of president for more than two terms in succession.” Mr. Putin was elected in 2000 and won re-election by a landslide 71 percent in 2004. He will complete two terms next year, so is ineligible under the constitution to stand for re-election. Elections to the Duma will be held Dec. 2, after which the political parties will nominate their candidates for the presidency. That election will take place March 2, with the new president taking office May 7. Barely six months before the election, Vladimir Putin dominates Russian politics like a colossus, with polls showing an approval rate as high as 80 percent. Videos have been released showing Mr. Putin in campaign mode, a vigorous 55, horseback riding and fishing, stripped to the waist. For months he has taken step after step to appeal to the majority of Russians who yearn for a return to the great-power status their country lost when the Soviet Union collapsed. He has been taking advantage of the booming global market for energy, renationalizing the oil and gas industry and using the proceeds to rebuild the Russian military. For years Russia has been developing the Topol-M mobile ballistic missile, the Bulava submarine-launched ballistic missile, the S-400 missile interceptor, a new evading warhead, fifth-generation fighter planes and missile-launching submarines. Progress was slow and funds were scarce, but the surge in oil and gas wealth made it possible to overcome problems and accelerate these programs. Now Mr. Putin is using his improving military to throw his weight around, confronting countries from Georgia to Norway. He has resumed long-range nuclear bomber flights, refuses to cooperate with Britain on a KGB murder, claims the North Pole for Russia, sells air defense missiles to Syria and threatens to target NATO countries by basing missiles in Russia’s Kaliningrad enclave. Instead of joining Europe and America to oppose the threat of militant Islam, Mr. Putin has turned to China, Iran and other authoritarian regimes against the West. He is recreating the Warsaw Pact in Central Asia — the Shanghai Cooperation Organization. Known as a “dictator’s club,” it is led by China and Russia and includes four former Soviet republics but expected to grow with Iran and other countries seeking to join. All this is fine with most Russians, who have the strong leader they wanted. A poll by the Yuri-Levada Institute published in February found 68 percent of Russians said their top priority was “security.” Democracy was hardly mentioned. Other findings were that 75 percent consider Russia a Eurasian state, while only 10 percent think they are part of the West. Mr. Putin has said he will honor the constitution. Nevertheless, he could decide to emulate his friend, Venezuela’s President Hugo Chavez, and make himself president for life. Amending the Russian constitution requires large majorities of both the Federation Council and Duma, which he undoubtedly could get from these rubber-stamp bodies, but it would require payoffs or concessions he may not want to make. So he appears to be grooming First Deputy Prime Minister Sergei Ivanov as his successor. Since the constitution bars him from running more than twice “in succession,” but leaves open the possibility of a later return, he may plan to have Mr. Ivanov run next year for one term and then replace him. Meanwhile, he would expect to control the country as a “gray eminence” from behind the scenes. But that is easier said than done. Mr. Ivanov is a highly capable former KGB officer and defense minister. If he wins the vast powers of the Russian presidency, it may not be easy for a former president to control him. Once out of power, Mr. Putin may find it hard to get back in. Of course, he could anoint a more pliable candidate to serve as caretaker president. Russian democracy is at risk. For the future of his country, Mr. Putin should honor the constitution and retire permanently next year. James T. Hackett is a contributing writer to The Washington Times based in Carlsbad, Calif. The essay above was used with permission.